Brighton is famed for its rock and fish & chips, but would you think of it as the hub of authentic Italian pizza? You will now, because Culture Calling’s dishing up our Top 5 pizza spots to be found in our favourite city by the sea. Here they come! Why not chow down on a slice of pizza at one of Brighton’s culinary success stories? When Sardinian-born Pietro Addis bought Donatello’s, first called Pinocchio, the building was close to derelict. Now it has expanded across three sites and pioneered al fresco dining in Brighton – all thanks to tip-top Italian food. If you fancy a pizza, you can pick between their 21 different topping options, all made from fresh ingrediants. Pizzas are also a staple of the set menus, if one course just isn’t enough – their tiramisu is really something special. Find Donatello’s at 1-3 Brighton Place. “It’s hard to find a good pizza. 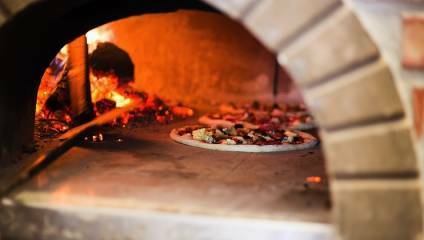 But a good pizza isn’t hard to do.” This has been the Pizzaface mantra since its birth in 2009, when chef Bertie and graphic designer Woody breathed life into a run-down pizzeria in Kemptown, armed with big dreams and a 20-year-old Blodgett oven. Now it’s one of Brighton’s most talked-about pizza spots, equiped with fresh veg, the best quality meat and top-notch Sardinian ‘oo’ flour. With vegan and gluten-free (spelt base) options, you have no reason not to get all up in Pizzaface – especially since they’ve recently teamed up with Boho Gelato to scoop up some game-changing ice creams and sorbets. Pizzaface is at 1 Coleridge Street, Hove, 35 St Georges Road, Brighton and 138 Montague Street, Worthing. Established in Naples in 1845, the family-run Pizza VIP spans across five generations. Their homemade sourdough recipe, traditional wood-burning technique, and high quality ingredients sourced from their farm in Naples (where they’ve produced dairy products for a 100 years) serve as the ultimate triple-threat in the hearts of Brighton and Saltdean. Not feeling straight-up, traditional pizza? Worry not, as there’s something for the vegetarians, vegans, gluten-frees, and those who only want to stock up on some Italian cheese, pasta, tomatoes, wine and salami. Find Pizza VIP at 19 Old Steine, Brighton and 67 Lustrells Vale, Saltdean. No, it doesn’t translate to “fat man”, but simply “made by hand”. “What’s in a name?” Shakespeare famously posed. In this case, it’s everything. Their famously soft and pillowy pies are achieved through their handmade dough being proved on site for 24 hours to ensure lightness and digestibility, making it one of the most sought-after slices outside of Naples. Fatto A Mano is at 77 London Road, Brighton and 65-67 Church Road, Hove. Carrying on with the name game, Edendum derives from the Latin for “eating”. Chosen by the Sunday Times Magazine as one of the three best Italian Restaurants in the country, this cosy pizzeria sets a bar for the ultimate “superior eating experience”. Edendum’s Northern Italian founders, Diego and Lorenza, strive to provide a taste of Italy’s lesser-known delights, serving up pizzette platters and gnocco fritto – a traditional Italian dish from Emilia Romagna, made from fried pizza dough. Be aware: everything is freshly cooked every day, so get there early to avoid them running out of your favourite dish! Edendum is located at 69 East Street, Brighton.